Welcome to Trimming The Shield Records. This label was started by the members of 33 Slade in 2002, and has since been owned and operated by Buick Audra. It is home to a whole crew of procrastinators. A note about independent music: this label is fully self-supporting. Please pay for the music you enjoy, and the good karma fairy will find you and make rad things happen, we swear. Thanks. We have so much to share with you today! First, we're so happy to announce the release of FC’S brand new video for "WHAT YOU RAVAGE"! They collaborated with director/editor Matthew Sterling for this project and love what he brought to it. We invite you to check it out over at the Nashville Scene where it premieres it today! Second, FC have a bunch of tour dates this Spring! Check the dates at the bottom of this email to see if they're coming to your neighborhood! If not, they'll be touring for a lot of this year. They'll do our best to come to you. Last, local friends can see FC headline the High Watt next Thursday night, April 4th. Thank you! We appreciate you all more than you know. Hello, all! Buick here. ’m going to do something this year; something outside of my band, Friendship Commanders. I’m not quite ready to talk about what it is yet, but I can tell you it’s already on the calendar—and not just my calendar. A few other people are involved. Something is going down. I’ve committed the last five-plus years to FC; the choice to do so was mine. Time was, I’d do a bunch of projects at the same time. I had solo output, other collaborations and bands, and was always writing for other outlets. And I was a clothing designer for big chunk of years, too. I made a lot of work, sometimes through very complicated periods of my life. I’ve said many times that the creative outlets likely kept me alive and sane through those times. However, it was hard to do the work justice. Touring was difficult, and I scarcely had label or PR support of any kind for the work I was putting out into the world. At a certain point, I had to simplify. I put all other projects and personas on the shelf, literally and figuratively. I paused. And when we started Friendship Commanders, I went all in. While I have had the occasional outside collaboration in that time, all participation has been brief and limited. In the six years we’ve been a band, we’ve released two full-length albums, four EPs, four Halloween singles, and seven videos. It’s been an intense focus. The band is my favorite thing I’ve ever been a part of. But I can’t pretend it’s the only thing I’ve been a part of. I’ve made a lot of work. And I just looked at a bunch of it because I was reorganizing the storage of all past releases to make room for new work. There isn’t any room. I’m maxed out, living among the work I don’t talk about for various reasons. Well, I’m going to talk about it. And I’m going to do something radical, in this age of crowdfunding and patreon and all that, I’m going to ask you to buy my previous work. This will help me pay for and make room for new work, both within my physical space, and also within myself. I’m treating it as a reclamation. My previous work has been wrapped up in difficult stories and realities relating to family, dysfuctional collaborative dynamics, loss, and grief. I set it aside to recover. But, I’m upright these days, and I’m going to claim it for what it was: mine. Regardless of who else was involved, these records are my writing and my concepts, outside of the few outside writers on Family Album. (More on that in a minute.) This work belongs to me, and I’d like to share it with you. I’d like to be known. And when/if there is something else to share, I hope you’ll check that out, too. But for now, I don’t want donations or to knit you a scarf or write out lyrics by hand. I want to share my previous work with you. And I’m making it as easy as humanly possible. All options and descriptions below. Also, I send terrific mail. I can guarantee you’ll like getting the packages. Bonus materials will be involved. I’m not going to strap a bunch of empty genre descriptors to the work below. It’s music. Some is electric, some is not. First album by my first band! We made it with J. Robbins at the legendary Inner Ear studio in Arlington VA! 33 Slade was Boey Russell on drums, Levi Fuller on bass, and me on guitar and vocals. I started my record label, Trimming The Shield Records, with my brother to release this album. It came out in December of 2002. This is the true beginning. My favorite track: "Mourning Rush"
This was our second album, produced in part with Grant Hart, and also with Matt Squire. Matt engineered it as well. Paul Kolderie mixed it. All of the above happened at Camp Street in Cambridge MA, a wonderful studio that is now gone, sadly. I loved working there and did so a few different times. I released this album after the band had already parted ways (geographically, primarily; Levi moved to Seattle). The record came out in 2007. I’m super proud of it. Oh, and this is the first record on which I ever acted as producer. My favorite track: "Paved In Teeth"
I tracked this record right after 33 Slade wound down. I had just moved to Brooklyn (like, the week before), and did this project at SOMD in College Park MD. I worked with Matt Squire again; he was briefly working at this studio before moving out West. This EP was tough. It was the first solo effort I ever made and it felt lonely and pretty revealing. It’s an eight song body of work that features just me playing a 1960 Fender Duo-Sonic and singing. Mixed by Alex Hartman. Came out in the Summer of 2006. Also, Stumptown printed these CD cases, and they’re really lovely. Cover logo and lettering by acclaimed tattoo and visual artist, Scott Campbell. My favorite track: "The Worst Of Me"
I could write a book about making this record and the one after it, no joke. But for now, I’ll just say that this work took a lot to get together for some reason. Singer was my first full solo album, and I made it over the course of two very long years. I made it in four studios between Boston, New York, and San Diego—with at least as many engineers! You’d never know it to look at the CD. It looks like a cool breeze. It wasn’t. BUT: I did make the trip to Ojai CA to master the record with the late great Doug Sax at the Mastering Lab, and man, was that a treat. If you don’t know about Doug, look him up. If you do know about him, you know that his contributions pulled the whole thing together with whatever wizardry he possessed. Not to downplay the work itself; I’m proud of it, But it was very cool to watch Doug change it for the better. This record came out in February of 2008. (I only have eighteen copies of this album left in the wide world; that feels crazy.) Cover logo and lettering by tattoo artist Ram Hannan. My favorite track: "Happy Loser"
This record also took around two years to track, and here’s why: I made it with twenty-three members of my families of choice and origin, in homes all over the country. Field recordings! I finally have enough distance from the experiences to say that I love this work, and I’m glad I did it when I did. I certainly don’t have the stomach for it now. Along with songs written by me, the album features work by Boey Russell (my brother), Catherine Huebsch (my mother), Randy Prentice (my biological father), and Fred Neil. Fred was a close friend and collaborator to my mother, and I grew up knowing him as a sort of uncle. I recorded “Little Bit of Rain” by Fred for this collection. I mixed the record with Eric McConnell, here in Nashville, which worked on a couple levels. I had recorded the music in homes, and Eric’s studio is also in his home (you’ve maybe seen his home on the cover of Loretta Lynn’s Van Lear Rose; that record was made at his house, too). And, Eric was terrific to work with, letting me lead the mixing sessions and see the vision through. I valued that experience very much. I returned to Ojai once more to master this body of work with Doug. Again, he applied magic; again, I was grateful. And that was the last time I saw Doug. He passed a couple of years later. This record was released in February of 2011. Cover logo and lettering by tattoo artist Ram Hannan. My favorite track: "Brand New Lie"
Those are the greatest hits! There are other records with other people, but I’m focusing on these right now. This is the major work of my life, pre-Friendship Commanders. I’m proud of it. I hope you like it. Thanks in advance for your support, and of course to the people who have been paying attention all along! All sales of these previous albums will contribute to Something New. Feels like a good system. Physical media bundles below! Oh—and I’m making a few ties for this project. I have a necktie line called B. Arson Neckwear, and to honor this new reclamation of my work, I’m making a limited edition tie called AUDRA. The fabric is the very silk I made the Singer cover dress from. It’s stunning. Photos and description below! Enjoy. If you absolutely can’t have physical media in your life, and have no use for the lyrics and liner notes (that we labor over as artists), you can buy the digital media on my bandcampprofile, on iTunes, or on Amazon. Thank you for honoring my work. Art is not charity; it is art. And I want to say this for myself, and for as well as for anyone else who needs to hear it: we are not our wounds. We are not extensions of our families. We are not what others think or say of us. We are our own. What a beautiful, powerful thing to be. As the year draws to a close, we'd like to thank you for your support! For buying and streaming the BILL album by Friendship Commanders, for attending their shows, for watching and sharing the videos, for writing about them, for letting them know you see and hear them. Thank you. FC were honored to share the stage with so many terrific musicians this year; too many to list. They have a good deal of touring ahead in 2019 and look forward to meeting more great bands and listeners! We'll post February and March tour dates next month, but for now, FC are doing some stuff close to home. They'll be live on the air with Jonathan Marx on Nashville's own WXNA on January 21st! They'll be talking about the BILL album, working with Steve Albini, why they made the record they did, and what's on the horizon for the band. And they'll be playing the music of other bands and artists they admire. Be sure to tune in! Also, they’re playing Media Rerun in Murfreesboro TN on February 9th. After that, they’re on the road. The links to everything Friendship Commanders released this year are below. Thanks again for listening and watching. Happy new year to you. NEW FRIENDSHIP COMMANDERS VIDEO OUT TODAY + NOV. YOUR DATES! Thanks so much for all of the support around the release of the BILL album by FC earlier this month! They played a terrific release party on October 16th in Nashville. Here's a great review of the record by Jen Dan for Rebel Noise. We appreciate all of you for listening! To that end, please enjoy this new video for the opening track on the album, "YOUR FEAR IS SHOWING." The song gives shout-outs to some of horror's great characters while also addressing the very real fear that some of us may live with. We hope you enjoy it. From today through midnight October 31st, we will donate the entirety of proceeds from digital sales of FC’s new album, BILL, to the Suicide Prevention Lifeline. We will also donate a percentage of all physical sales of the album on those dates. Also, they’re heading out for some tour dates in just a few days! Please check to see if FC are coming to your city! 11.4 // Columbus OH // Cafe Bourbon St.
BILL BY FRIENDSHIP COMMANDERS IS OUT TODAY! IT'S A HAPPY DAY OVER HERE! The BILL album is now available everywhere you get your music! The vinyl arrived this week and it's absolutely beautiful. There are several merch bundles available on the Bandcamp page! Thanks to Steve Albini and everyone at Electrical Audio; thanks to Matthew Barnhart and the good folks at Chicago Mastering Service! Thanks to our team: Mark Vieira, Austin Griswold, and Aaron Gray! Thanks to Zach Barocas, Iris Robert, and Ric Simenson for the stunning imagery and artwork. We are incredibly grateful. And thanks to all who have listened and will listen. If you haven't yet, please watch the videos for "SAW AND HEARD," "WOMEN TO THE FRONT" and "HORRIFY"! FC’s official album release show is on October 16th, here in Nashville. They're excited to be part of a crazy night of music with all kinds of people, and the whole event 100% benefits Best Buddies Tennessee! They'll even be donating a portion of our merch sales to the organization, including the BILL album! Additional Fall tour dates to be announced very shortly, so make sure you follow them on Bandsintown for those updates. Thank you all so much. Thank you for your continued support. We hope you love the new music. NEW SINGLE FROM FRIENDSHIP COMMANDERS "SAW AND HEARD" OUT TODAY! The third FC single is here, friends! We're thrilled to share "SAW AND HEARD" with you all! This was one of the first songs written for the BILL album, and many of you have heard Friendship Commanders play it on the road over the last two years. The music was produced by Steve Albini and FC. They made a lyric video for this one; watch it below. The moment at which we reclaim our personal traumas and difficult experiences is one in which we gain the power. Staring abuse and abusers in the eye and saying, “I see it now, and I see it so very clearly,” strips those forces of any power they once possessed. It’s never too late to take back what’s yours, dignity included. The BILL album is now only two weeks away! You can still pre-order it on vinyl, CD, or as a download, if you haven't already. And please check out the recently released videos for "WOMEN TO THE FRONT" and "HORRIFY"! Fall tour dates (and a rad local album release show) to be announced soon! NEW SINGLE + VIDEO FROM FRIENDSHIP COMMANDERS "WOMEN TO THE FRONT" OUT TODAY! The second single is here! Please enjoy the new FC new single and video, "WOMEN TO THE FRONT," now premiering on New Noise Magazine! The video was directed by Buick Audra, shot by Jerry Roe and Perry Bean! Noteworthy performances were contributed by Heather Donegan and Grant-Lee Phillips, among many others! Song written by Buick Audra; produced by Steve Albini and FC. Cover photo by Zach Barocas; art and layout by Buick Audra and Ric Simenson. Thanks to everyone who has already ordered the BILL album! We sold out of the vinyl + necktie bundles, but there are a few of the CD + necktie bundles left! And if you haven't seen the video for "HORRIFY," we encourage you to do so! women to the front, step up! why’s it so easy to separate from our kind? NEW FC SINGLE + VIDEO "HORRIFY" OUT TODAY! // PRE-ORDER BILL ALBUM! First, the debut single from Friendship Commanders' BILL album is here! 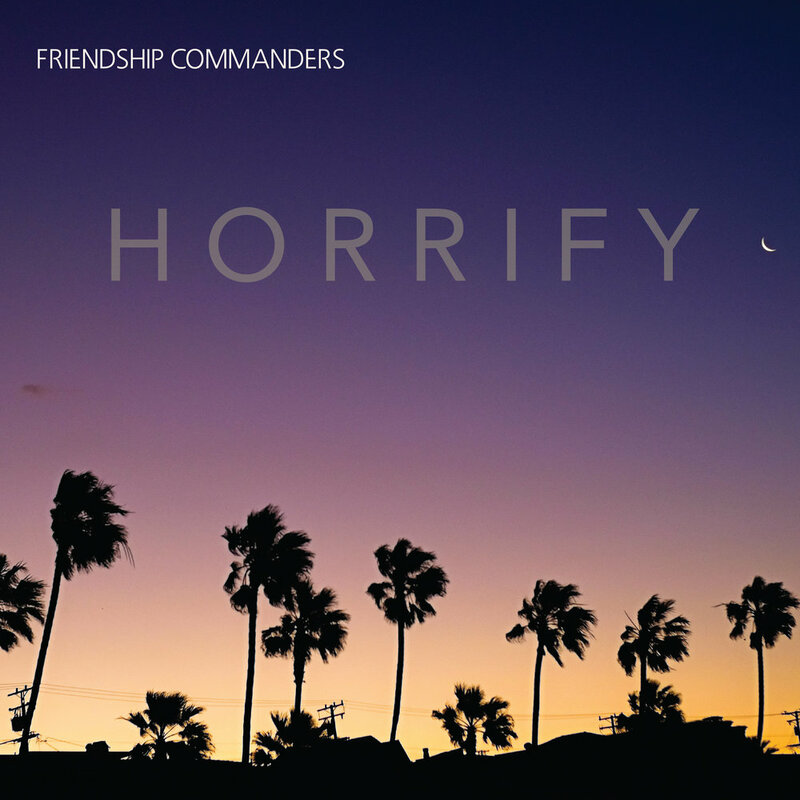 We're so happy to share "HORRIFY" with you all. Links to the song on different platforms below, as well as a link to the video for it, directed by Jerry Roe, shot by Jerry Roe and Perry Bean! Special thanks to Kat Jones, EJ Holmes Dawson, and Perry Bean for their incredible help. Song written by Buick Audra; produced by Steve Albini and FC. Cover photo by Zach Barocas; art and layout by Buick Audra and Ric Simenson. If you're interested, the lyrics are at the very bottom of this post . Second, you can now pre-order the BILL album! We're offering it on vinyl, CD, and as a digital download, of course. There are even a handful of extra special bundles available, in which you can get a handmade skinny necktie made by Buick herself (she has a line of ties called B. Arson Neckwear) and a copy of the album on CD or vinyl. We destroy that which we love; it sometimes feels safer than the alternative. But tearing down another person or a relationship also tears down part of the self. It’s a temporary fix for a bigger problem. We’d be wise to look inward instead of at the faults of others, but where’s the fun in that? In short: friendship is hard. and this: are you are horrified? 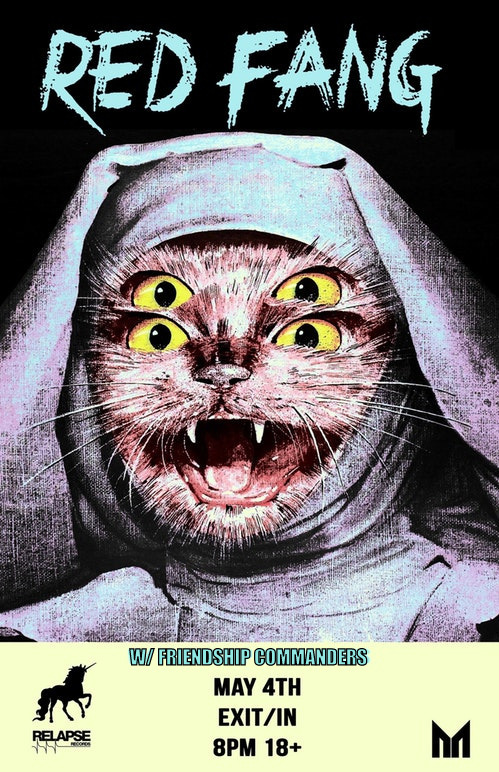 and this: are you horrified? We're thrilled to finally share the release date of the second album by Friendship Commanders, BILL: October 5th, 2018. They made the record with Steve Albini at Electrical Audio in Chicago IL. The first single, "Horrify," releases on all digital platforms on August 17th! There will be more to come between then and the album's release, so please be sure to follow, like, and subscribe to FC wherever you get your music! Links below. From FC: As a body of work, BILL is about to trying to be a human and know other humans during inhumane times. Part of that is reckoning with one's self, part of that is either accepting those around us or letting them go. And yet another part of that is making sure that we're not just focusing on our own success and safety, but those of the community around us. It's time for tolerance and service and hope, not destroying one another and ourselves. The stunning album cover photo was taken by Zach Barocas. The design was done by Buick Audra and Ric Simenson. Also, FC are doing some dates with ROYAL THUNDER next month! Dates below. Additional tour dates in support of the new album to come soon! FRIENDSHIP COMMANDERS: RAISE YOUR VOICE TOUR IN MAY + RED FANG SHOW! Happy almost Spring! Friendship Commanders are heading back to Texas for their second year of Houston Punkfest at the end of April! Also, they're doing a hometown show with RED FANG on May 4th! Tickets are available now HERE. In addition to those shows, check out the RAISE YOUR VOICE tour! They've decided to travel to some of the states with the lowest voter turnout numbers in recent elections and offer voter registration options right at the shows. In states that have any kind of online voter registration, they'll have electronic registration stations. In states where you still have to fill out paperwork, they'll have that, too! FC believe in everyone's right to have a say, and voting is part of that process. Plus, these shows will be rad hangs. Dates below, and more will be added to this list! Be sure to track them on Bandsintown for updates and additional events. Last, we know we haven't told you when the new record will be out. Soon, friends. Soon. Copyright © 2002-2019, Trimming The Shield Records. All rights reserved.